Today, I was looking for some interesting facts on sunscreen for my weekly #MakeupMonday tip, but I ended up doing ingredient research instead. One website I looked at suggested that products with sunscreen might also contain Retinyl Palmitate, which is another form of Vitamin A or Retinol. 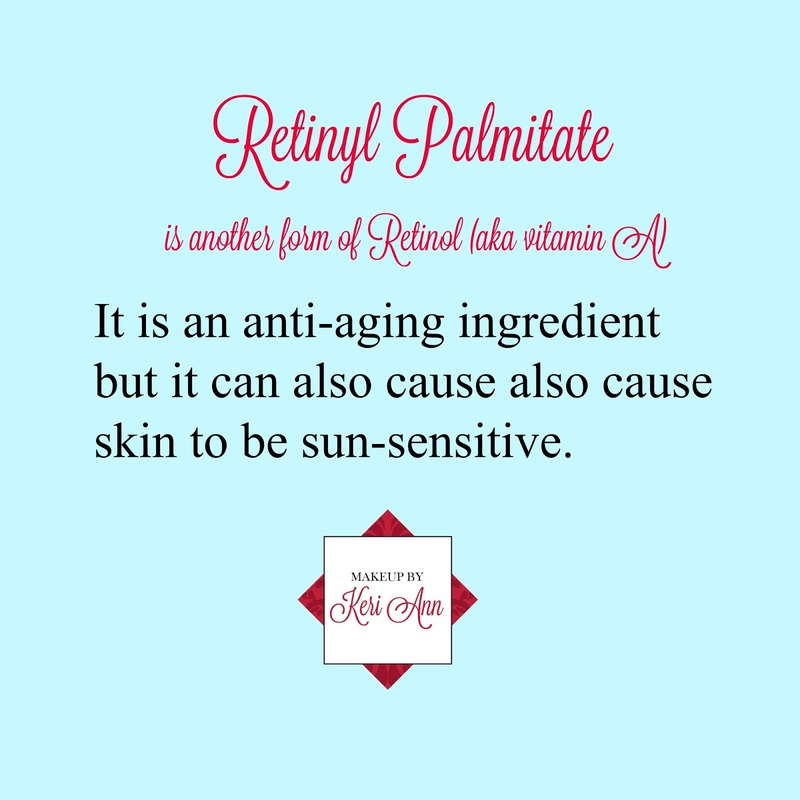 Retinol and Retinyl Palmitate are used in anti-aging products. I am totally on board with helping my skin as youthful as possible. 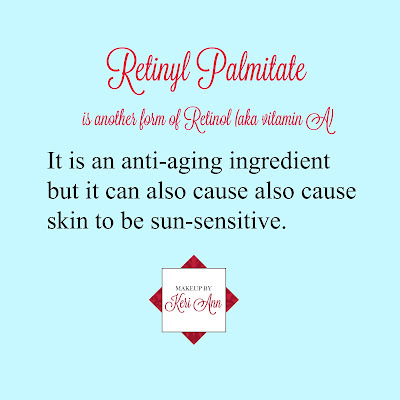 However, anyone who's been under a doctor's care while using Retinol knows that Vitamin A can make your skin more sun-sensitive. Wearing sunscreen & sun protection while using Retinol is very important. To this un-trained chemist, including this ingredient in sunscreen seems to be counter-productive. So I began checking some ingredient lists and I did find that Retinyl Palmitate was used in some sunscreens and some moisturizers that contained sunscreen. But, those particular products are no longer available for retail (at least on the product list I reviewed - I didn't spend a huge amount of time researching a large variety of moisturizers & sunscreens - so check your own labels). I would never put sunscreen on my eyelids and yet I know I use shadow primer and mineral eyeshadows every day on my eyelids. I use moisturizers and foundations that contain sunscreen, but apply mineral based bronzers and cheek colors on top of those products. This is super interesting! One of the reasons I'm trying to make the switch to natural products is because of different things like this! I am glad you found it interesting, Tabitha! Thanks for stopping by! Thanks for the tip! As a chemical engineer I'm always interested in the ingredients in everything I put in my body from skin, makeup, to food! I will definitely keep this in mind about the sun-sensitivity! Shalanda, it would be interesting to get your point of view on cosmetics & the chemicals deemed "safe"! How interesting! I need to be better about reading labels especially for skin products. I've been trying to get back to the basics and buy more natural/organic products, but it's so hard. Linh, there are so many ingredients in our products, it's hard to keep up with all of them. So interesting! I definitely haven't done research on this but now I want to! Please let me know if you find any other interesting facts, Jessica! Thanks for sharing! I hadn't realized that before. Definitely important to read the labels before putting things in our face! Thanks for stopping by, Amy. We put a lot of faith in our cosmetic brands without realizing what's really inside. Totally unaware of the retinol in so many common makeup products. I'll definitely be checking out the labels now! Thanks for the information girl!! You are welcome, Nikki! Thanks for stopping by! Most every anti-aging/wrinkle reducing/repair products have Retinol in them and they work very well. I really think it's best to use the Retinol products at night and then use really good SPF moisturizers during the day to protect your skin from the UVA rays of the sun. Wow, I would've never thought to research this! I'll be thinking twice and checking ingredients from now on! I am always happy when I can pass on new information! I would have never thought of this! Very interesting! Happy to provide some "food for thought", Ourmessytable! Interesting! There are so many different ways of looking at what is good for your skin and what is not when it comes to doctors/general information. I always try to use the best products for my skin. All great info that I will be keeping in mind. Thank You for sharing! Had no idea Vitamin A and Retinal were the same thing! Game changer. Glad to know you learned something new, Ashley!